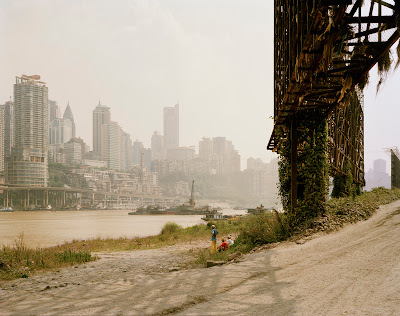 Head over to Nadav Kander´s site for some real treats but before you do here are a few images from his Yangtze, From East to West project to whet your whistle. To best appreciate this work one really needs to see the images anywhere but on a computer screen to be honest. I recently had the opportunity to view them when they were on display at what is probably my favourite gallery for checking out contemporary photography in London, Flowers East. In fact, I´ll be there this Friday for the Edward Burtynsky opening so come along and say hello if you are out Hoxton way. 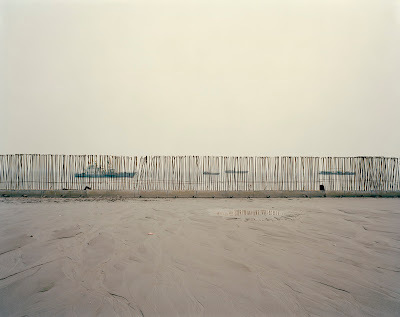 "The Yangtze River, which forms the premise to this body of work, is the main artery that flows 4100miles across china, travelling from its furthest westerly point in Qinghai Province to Shanghai in the east. 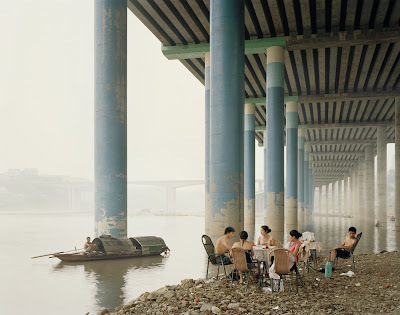 The river is embedded in the consciousness of the Chinese, even those who live thousands of miles from the river. It plays a pivotal role in both the spiritual and physical life of the people. More people live along its banks than live in the USA – one in every eighteen people on the planet. Using the river as a metaphor for constant change, I have photographed the landscape and people along its banks from mouth to source. Importantly for me I worked intuitively, trying not to be influenced by what I already knew about the country. After several trips to different parts of the river, it became clear that what I was personally responding to, and how I felt whilst being in china, was permeating my pictures; a formalness and unease, a country that feels both at the beginning of a new era and at odds with itself. China is a nation that appears to be severing its roots by destroying its past by moving forward at such an astounding and unnatural pace. I felt a complete outsider and explained this pictorially by ‘stepping back’ and showing humans as small in their surroundings. Common man has little say in China’s progression, and this smallness of the individual is alluded to in the work. I feel that there are strong parallels in China with the 20th Century immigrants who poured off the boats onto American soil, a new beginning without roots. Millions of domestic migrant workers are travelling from rural areas to the cities. This condition manifests itself throughout China’s social fabric and echoed my own feelings of dislocation. Further layers have been added to certain images by compositing single figures into a scene, twice removed from their natural habitat. Rather than looking to the future with hope, the photographic migrants appear in limbo, unable to observe their past at a time of uncertain future. Although it was never my intention to make documentary pictures, the sociological context of this project is very important and ever present. The displacement of 3 million people in a 600km stretch of the River and the effect on humans when a country moves towards the future at pace are themes that will inevitably be present within the work. China is progressing rapidly, and the landscape – both economically and physically – is changing daily. These are photographs that can never be taken again."